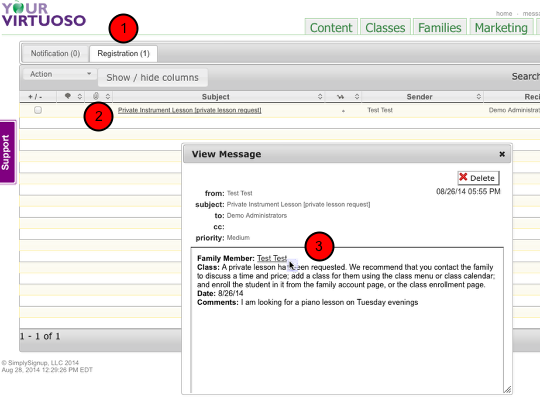 There are different approaches to handling individual lessons, depending on your online enrollment and tracking needs. YourVirtuoso supports several variations, and before you start you may want to consider the following. Do you want full, "hands free" online enrollment? If you do, you will need to set up all your private lesson time-slots ahead of time. On the other hand, if you prefer to handle parts of the enrollment process yourself, in consultation with the customer, as many of our studios do, you can wait until you have a student enrolled to set up the class. Do you want to keep track of specific time-slots, attendance, or makeup/rescheduling? If you do not, you might find it easier to put all your private students into one "class" (or a few classes). We do not recommend this, as it makes many of the built-in features like confirmation emails, family class calendar, makeups etc. 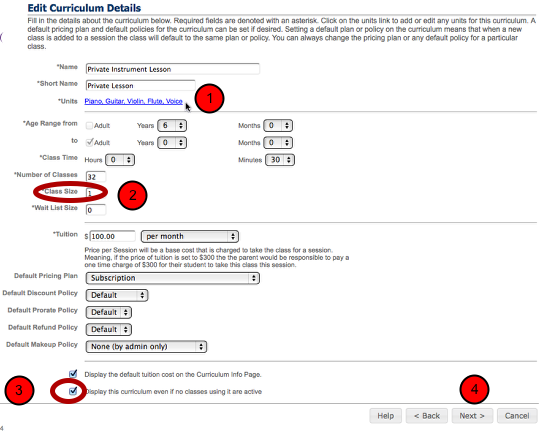 less useful, but it does simplify the enrollment process a little. You contact them to finalize day, time etc. 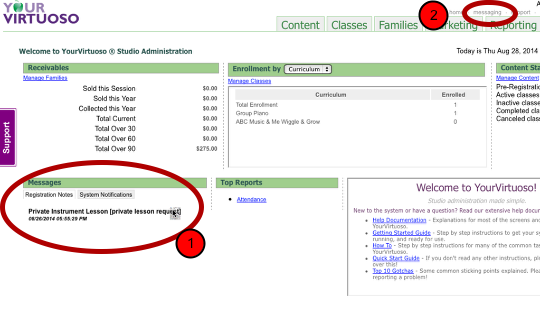 If you have set up an affiliation as a General Music studio (MyInfo/Main), you will have a pre-defined private lesson curriculum already configured. Just select it. 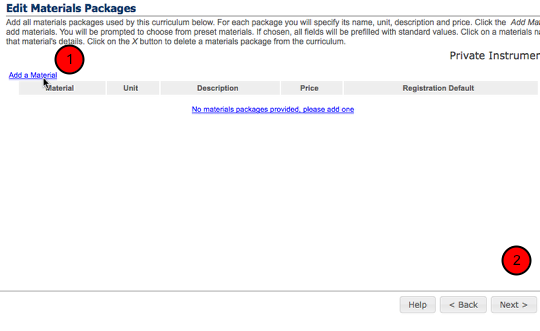 Add or Edit the curriculum parameters. You can choose to have different units for different instruments as in this example, or you can set up a new curriculum for each instrument, and use the units to track what year/level the student is at. The former is simplest, but the latter allows you to set up and track materials for different levels. 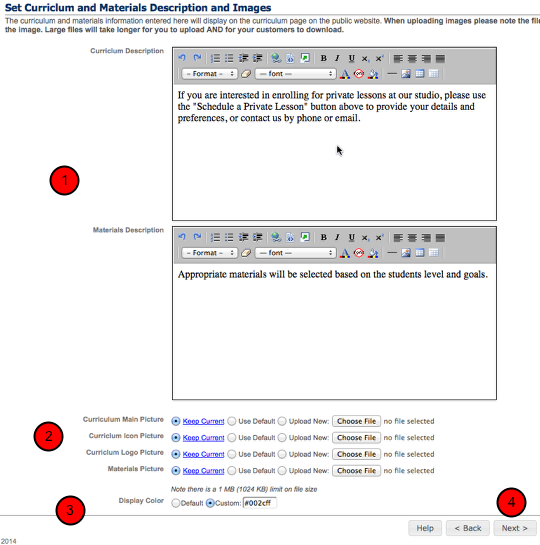 The curriculum MUST be set to display even if no classes using it are active, so that it is always on your site. 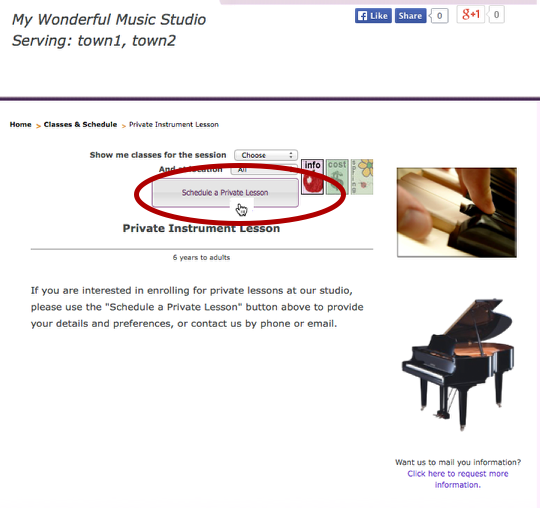 When a family sees the listing for your private lessons on the website classes page, they click on it to get to the description page shown above. 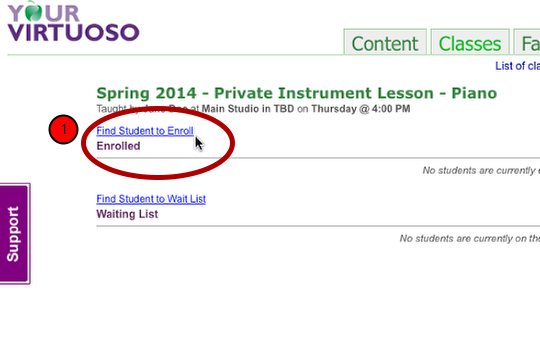 The large button and the text you provide in the description should encourage them to click to "Schedule a Private Lesson"
To see a complete list of these notes, click on the small messaging link above the main menus on the admin pages. The pop up window shows the specifics and the family's comments. 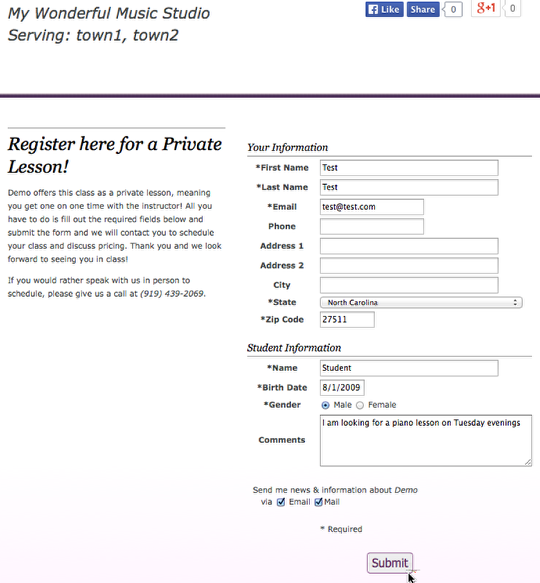 You can click the Family Member name to go to their account information and contact them to pick the best time/teacher etc. Make sure you are viewing the correct session using the session selector, and scroll to the first week of classes for this new student. A window will pop open with the session, date, day and time already set. 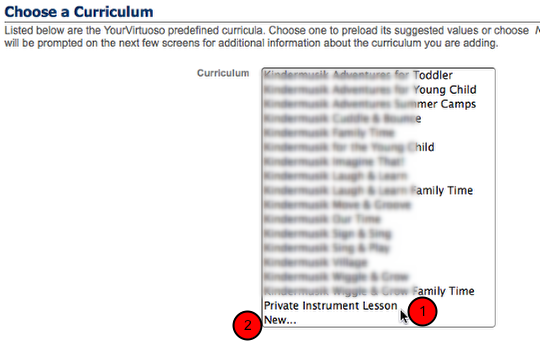 Select your private lesson curriculum and unit. Set the correct parameters for the class. The start and end date will update automatically to reflect the curriculum settings for number of classes/weeks and the session calendar holidays/breaks. Click OK and the class is created. 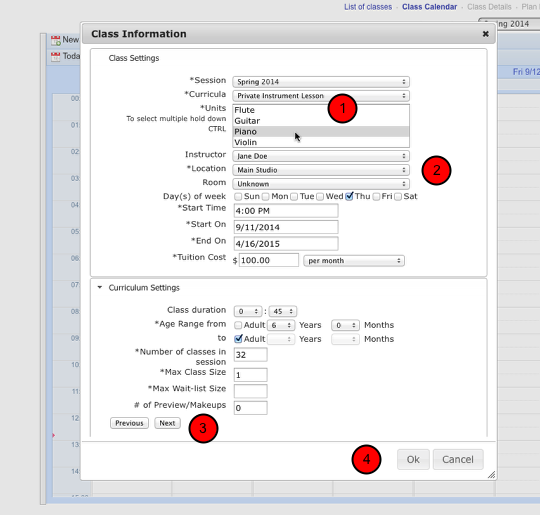 Note: If you are creating several classes all these settings will default to the last ones used, making the entry of several classes a simple two or three click process. 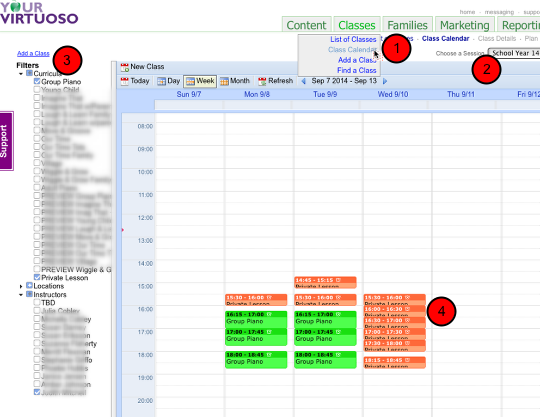 If the class has updated and can be seen on the calendar, just click it. If it is not yet visible, click on List of classes and select the new class there (it will be the one that says "initiated" in the right, status, column. Click Find a Student to Enroll and find & enroll the new student. This will complete the private lesson scheduling, and set up the appropriate fees and payment schedule according to the plans and policies you have set up.